Management is hard. People do things that surprise even the most jaded manager. Sometimes the surprises are good, but often they undermine your faith in humanity. My first entry into the management arena was at the ripe old age of 25. The first lesson I learned was that I was a much better manager before I became one. It’s easy to second guess management decisions when you don’t have the responsibility that accompanies them. Every decision is a complex challenge that has to balance the needs of shareholders, employees, customers, and individuals. Sometimes, finding the right answer requires the wisdom of Solomon. If being a manager is hard, managing a high growth company nears impossibility. Change is constant. People resist change. Sometimes managers have to pull their team into the next phase of the business’ development. The pie in the sky leadership mantras don’t mean much when employees can’t see the future. Some think that leadership ability is all that is needed to keep companies on the right track. They are wrong. The best leadership qualities will not stop toxic employees and customers from undermining company objectives. Leadership is the ability to influence people. 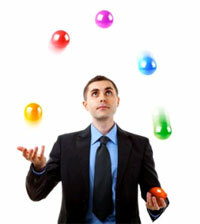 Management is the ability to direct business affairs to achieve objectives. Ideally, the people ultimately responsible for corporate success would have a combination of the two. If not, management skills trump leadership because growing a business requires more than being a good people person. Fire toxic employees and customers. Time and effort invested in trying to change people that creating unwarranted problems is wasted. Invest in the people who contribute to growth and profitability instead. Participate in an Employee Assistance Program. Having the EAP allowed our management team to focus more on the needs of the company and less on individual team member issues. Create a bonus program that rewards people globally and individually. We tied bonuses to profitability, team accomplishments, and individual objectives. Listen, question, and think before you do. Information provided isn’t always accurate. Double check the facts before acting. People first. You can’t fake caring. If you don’t care about the people who make good things happen, you don’t need to be in management. Communicate well. Resistance to change is reduced when people understand why things are changing and know what to expect. Fear of the unknown is crippling. Take time to celebrate. Pausing a moment to celebrate wins and recognize jobs well done revitalizes the people doing them. Watch for morale quicksand. Employee morale can seemingly change in a flash. Watch for events and activities that will negatively affect morale so they can be nipped in the bud. Take care of yourself. If you let yourself get run down, you’ll take your team with you. Plan and do activities that recharge your batteries. It’s good for you and a good example for others. To learn more about improving management skills, email Debra at dellis@wilsonellisconsulting.com.